Curb Records recording artist Dylan Scott and his stage-scorching band rolled into Chicago for a show at the legendary Joe’s Bar on Weed Street last week. Forty-five minutes before the show, Joe’s was packed wall to wall with a thousand of his fans, and when he broke into his new single “Crazy Over Me” most of them could sing along, even though it wouldn’t be released for a week. Dylan Scott is an artist whose fans are so enthusiastic about his music that every new thing he does gets massive attention, even if some of it stays under the big media radar. When Curb released the “Stripped” version of “Crazy Over Me” on video in late July, so many of his fans found it, watched it and shared it that by the time he got to Chicago just a few weeks later, the sold out crowd already knew it like it was a hit. It’s a sight to see, that’s for sure, Logan Robinson (Dylan’s brother) and Sean Barger on guitars, Darrick Cline on bass and Garrett Cline on drums. Just like Dylan Scott, they know what they’ve got, and they’re just relentless in bringing it to the people who came to see them play. 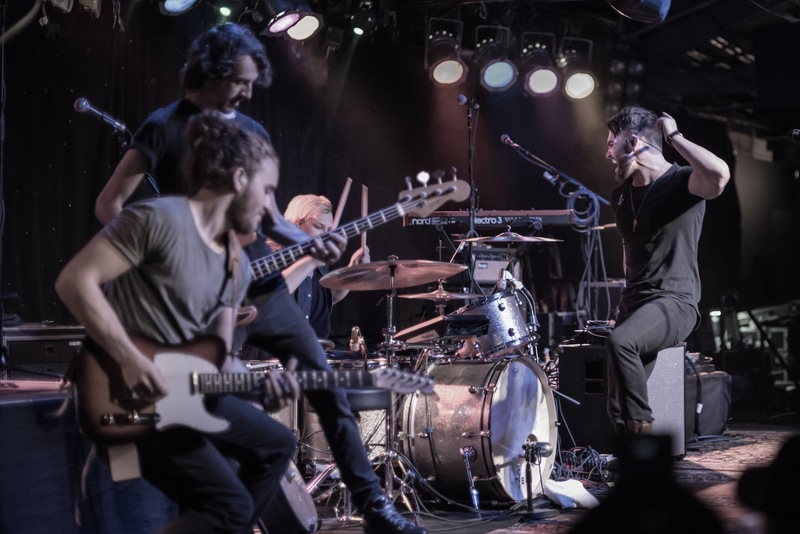 Here’s a look at just some of the excitement of this amazing band on stage at Joe’s, and if you want to read more about Dylan Scott, check out this story about him at The Huffington Post: Dylan Scott and Where It All Comes From. Dylan Scott’s new single “Crazy Over Me” is at iTunes. Photos by Johnny Nevin, and there are more photos of Dylan Scott at johnnynevin.com.